Consistent with widespread media reports of extreme heat and adverse impacts in various places, the latest results from ERA-Interim indicate that the average temperature over land areas of the extratropical northern hemisphere reached a new high in July 2010. May and June 2010 were also unusually warm. Here, the ERA-Interim, also referred to as ‘ERAINT’, is the ECMWF’s state-of-the-art reanalysis. But the ERAINT describes the atmospheric state only since 1989, and in isolation, it is not the ideal data set for making inferences about long-term climate change because it doesn’t go all that far back in time. However, the statement also draws on the longer reanalysis known as the ERA40 re-analysis, spanning the time interval 1957-2002. Thus, taken into context of ERA40, the ECMWF has some legitimacy behind their statement. The ERAINT reanalysis is a product of all suitable measurements fed into a model of the atmosphere, describing all the known relevant physical laws and processes. Basically, reanalyses represent the most complete and accurate picture that we can give for the day-to-day atmosphere, incorporating all useful information we have (satellites, ground observations, ships, buoys, aircrafts, radiosondes, rawinsondes). They can also be used to reconstruct things at finer spatial and temporal scales than is possible using met station data, based on physical rules provided by weather models. The reanalyses are closely tied to the measurements at most locations where observations – such as 2-meter temperature, T(2m), or surface pressure – are provided and used in the data assimilation. Data assimilation is a way of making the model follow the observations as closely as possible at the locations where they are provided, hence constraining the atmospheric model. The constraining of the atmospheric model affect the predictions where there are no observations because most of the weather elements – except for precipitation – do not change abruptly over short distance (mathematically, we say that they are described by ‘spatially smooth and slowly changing functions’). There are also locations – notably the in the Polar regions and over Africa – where ground-based measurements are sparse, and where much is left for the weather models to predict without observational constraints. In such regions, the description may be biased by model shortcomings, and different reanalysis may provide a different regional picture of the surface conditions. Surface variables such as T(2m) are strongly affected by their environment, which may be represented differently in different weather models (e.g. different spatial resolution implies different altitudes) and therefore is a reason for differences between reanalyses. Furthermore, soil moisture may affect T(2m), linking temperature to precipitation. The energy flow (heat fluxes) between the ground/lakes/sea and the atmosphere may also affect surface temperatures. However, both precipitation and heat fluxes are computed by the reanalysis atmosphere model without direct constraints, and are therefore only loosely tied to the observations fed into the models. Furthermore, both heat fluxes and precipitation can vary substantially over short distances, and are often not smooth spatial functions. While the evidence suggesting more extremely high temperatures are mounting over time, the number of resources offering data is also growing. Some of these involve satellite borne remote sensing instruments, but many data sets do not incorporate such data. In the book “A Vast Machine“, Paul N. Edwards discusses various types of data and how all data involve some type of modelling, even barometers and thermometers. It also provides an account on the observational network, models, and the knowledge we have derived from these. Myles Allen has written a review of this book in Nature, and I have reviewed it for Physics World (subscription required for the latter). All data need to be screened though a quality control, to eliminate misreadings, instrument failure, or other types of errors. A typical screening criterion is to check whether e.g. the temperature estimated by satellite remote sensing is unrealistically high, but sometimes such screening may also throw out valid data, such as was the case of the Antarctic ozone hole. Such post-processing is done differently in analyses, satellite measurements, and reanalyses. 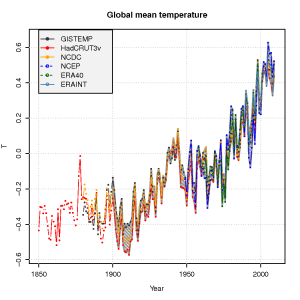 The global mean temperature estimated from the ERAINT, however, is not very different from other analyses or reanalyses (see figure below) for the time they overlap. We also see a good agreement between the ERA40 reanalysis, the NCEP/NCAR reanalysis, and the traditional datasets – analyses – of gridded temperature (GISTEMP, HadCRUT3v, NCDC). inferences about extreme temperatures and unprecedented heat waves? An important point with reanalyses, is that the model used doesn’t change over the time spanned by the analysis, but reanalyses are generally used with caution for climate change studies because the number and type of observations being fed into the computer model changes over time. Changes in the number of observations and instruments is also an issue affecting the more traditional analyses. Since the ERAINT only goes as far back as 1989, it involves many modern satellite-borne remote sensing measurements, and it is believed that there are less problems with observational network discontinuity after this date than in the earlier days. It may be more problematic studying trends in the ERA40 data, due to huge improvements in the observational platforms between 1958 and now. Hence, it is important also to look at individual long-term series of high quality. These series have to be ‘homogeneous’, meaning that they need to reflect the local climate variable consistently through its span, not being affected by changes in the local environment, instrumentation, and measurement practices. An analysis I published in 2004, looking at how often record-high monthly temperatures recur, indicated that record-breaking monthly mean temperature have been more frequent that they would have been if the climate were not getting hotter. This analysis supports the ECMWF statement, and was based on a few high-quality temperature series scattered across our planet, chosen to be sufficiently far from each other to minimize mutual dependencies that can bias the analysis. The ECMWF provides data for some climate indices, such as the global mean temperature, and the National Oceanic and Atmospheric Administration (NOAA) has a web site for extreme temperatures and precipitation around the world with an interactive map, showing the warmest and coldest sites on the continents. Another useful tool is the KNMI ClimateExplorer, where people can both access data and carry out different analyses on line. It is also possible to get climate data on your iPhone/iPod Touch through Apps like Climate Mobile. Update: I just learned that NOAA recently has launched a Climate Services Portal on www.climate.gov. Update: http://rimfrost.no/ is another site that provides station-based climate data. The site shows linear trends estimated for the last 50 years. Edwards’ book is brilliant – a must read for anyone interested in appreciating the complexities of the data collection and analysis systems that underpin weather and climate prediction. He makes use of some interesting metaphors, including ‘data friction’ and ‘computational friction’, to point out that there are many places in the global observing systems where data has to be transferred from one format to another, and in each case, such changes require effort, and generate wastage (hence the ‘friction’ analogy). And he has an interesting take on the difference between ‘observational data’ and ‘models’ – basically, there’s no clean distinction – models are empirical summaries of the observational data, and observations are processed through models before they become usable data. Stick with it, as his histories of the data collection systems are fascinating! UAH temps for August has tied the 1998 record and current La Nina cooled SSTs are rapidly approaching the 2009 El Nino fueled SSTs, so it looks like 2010 could break the record in all the datasets. Didn’t the retreating Alpine Ice of the European Summer of 2003 reveal human remains and artifacts from earlier warmings hidden by the more recent ice? A request: provide a summary conclusion for these articles. I appreciate that RC is intended to provide a more technical analysis than other blogs, but I skimmed that article once and then read it properly and I’m still not certain what conclusion I’m supposed to draw – or even if there is one. To reach as wide an audience as possible, a ‘plain English’ summary would be very useful. TIA. Could the comparison include 1930’s as well? At least in Scandinavian countries, summers during 30’s were as warm as or warmer than 2000’s. 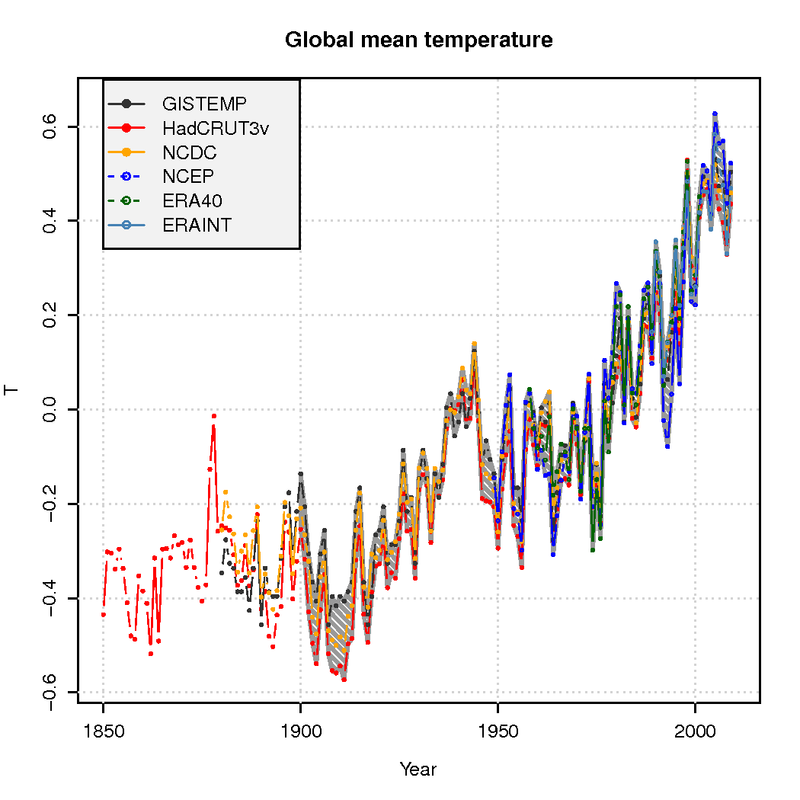 Also, there shouldn’t be a major gap in the temperature history between 1930 and 2010. I’m a bit confused, was the question ever answered here? I was not able to decode it, if it was. You may want to summarize it better at the end. I don’t understand why the temperature record, as is, is not adequate to perform this type of analysis. Can you not get a reading on heat and cold waves from daily temperature records? Does the “official” temperature record support this assertion about more frequent extremes? What exactly does it show? I confess I become immediately skeptical once an analysis begins by performing a “reanalysis” of an existing data set. This suggests data mining techniques are being used and is a clear path to confirmation bias. This is the same thing as testing many different statistical signal extraction techniques, picking the one you “like”, and then finding reasons to justify the selection after the results are known. “record-breaking monthly mean temperature have been more frequent that they would have been if the climate were not getting hotter” – I don’t think this is very surprising. Does anyone know where I can find the outputs of various climate models, particularly over the satellite era and ideally with runs showing with and without anthropogenic influences? Rasmus — Clear and useful exposition, thank you. A smooth function, even C-infinity smooth, can change value rapidly over a short interval. For example, a step function, not even continuous much less smooth, can be approximated as closely as desired by an S-shaped function such as the error function. So to say \spatially smooth\ doesn’t describe what I think is happening, namely a function which changes slowly over extended intervals (as well as being smooth). I suggest defining \slow function\ and then \spatially slow function\ appears, to me at least, descriptive. Orkneygal @3 — Yes. Here are some pertinent links. It was really interesting to get some background to “re-analysis” generally in the inline response at #6.
nice post. Finally I grasp what a re-analysis is too. I agree to Gavin’s response to Tom Scharf (#6), but it needs a minor correction. The Japanese effort of reanlysis is not JAXA, but JRA. In the “data sources” page here, it is correctly listed as “JRA-25”. To explain “reanlysis” to people outside of the community of meteorology is not easy, since we need to explain how weather prediction is made routinely. Edwards’ book “The Vast Machine” is very welcome as it explains the historical context from the beginning of exchanges of weather records to modern reanalyses. UAH on which measure? The maximum on global LT5.3 was +0.77°C in April 1998; August 2010 was +0.51°C. See monthly plot here. BTW, any one know what’s up with Roy Spencer’s Discover series? (Click Redraw, check all the boxes, then Redraw again.) The Ch04 “near surface layer” behavior there seems to be way out of whack with everybody else lately (plot). The Holocene maximum was a period about 5,000 years ago when global temperatures were about 1’C above the recent historical norms. Currently temps are about .7’C above those norms. The difference between then and now of course, is that that Holocene temperature was a maximum, while the current temperature rise is increasing and projected to be 3’C +- 1’C or so within the next 90 years, and with greater warming following that. From the opinions you have expressed on other web sites, you are a denialist who really isn’t interested in the answers provided to you. Often repeatedly provided to you. As someone who works to communicate climate change to the public, I’m afraid over 99 per cent of the public wouldn’t be able to make heads or tails of this – even some of your sophisticated readers say so in the comments above. And this is a crucial topic, because the vast majority of the public will understand and care about climate change in proportion to how much they understand that it can and will increasingly affect all weather, including theirs. You’ve often demonstrated that the scientists publishing here can communicate well to the public, and this is a topic that deserves the most clear communication possible. 2010 has the warmest January-August on record, and 2010 has a good chance to be the warmest year on record. This was predicted in January, 2009 by James Hansen and his NASA-GISS group. This comes at the end of the warmest decade of global average temperature on record. Beginning in the 1980s, every decade has been warmer than the decade before, with the average for the last three decades each being higher than the record year global average temperature during the previous decade. Because it is getting warmer and especially during a record warm year, one would expect more record high than record low temperatures. That’s exactly what we’ve seen in 2010, with 19 nations setting their all-time record high temperatures, and Pakistan’s record high was also Asia’s all-time record high of 128 degrees Fahrenheit. The nations with record-high temperatures range over much of the globe and include nations in South America, Africa and Asia. In the U.S. the National Climatic Data Center keeps the most dependable temperature records back to 1880 (thermometers were developed more than a century and a half before this, and through the 1800s and often before it was common practice to hang thermometers in the shade). In the contiguous 48 states there were slightly more cold records than heat records in the 1960s and 1970s, but from January 1, 2000 to now there have been over twice as many heat records as cold records. According to a paper by Gerald Meehl at the National Center for Atmospheric Research, models show that if human burning of fossil fuels is not curtailed there could be 20 heat records for every cold record by 2050, and by 2100 the ratio could be 50 to 1. There are many other well-documented and consistent effects of climate change including the significant melting of 90 per cent of the world’s glaciers, increased melting of summer and early fall ice throughout the Arctic Ocean, increased severity of droughts and more dramatic precipitation events of all kinds (including snow where it is cold enough to snow) because warming causes increased evaporation that has led to a 4 per cent increase in water vapor since 1970, with about another 4 per cent added for every degree in Fahrenheit increase. According to the 2007 IPCC Report, the global average temperature could increase by 3 to 10 degrees Fahrenheit by 2100. An atmosphere with 40 per cent more water vapor than now would be unrecognizable to any human, with frequent storms of all kinds on scales we can’t imagine. Climate looks at the averages of weather, and climate scientists don’t claim to know what will happen in any given time and place in the months and years ahead, just like actuaries don’t know what will happen to any individual, but they’ve studied the average of things like life expectancies among various large groups. Climate scientists don’t know where and when temperature and precipitation records will be broken, but they are confident that the next decade and especially century will have more records of all kinds broken than the last decade and century. Orkneygal (3), David Benson (9); it is important to be clear that the examples of human artifacts covered by ice and now being revealed where typically dropped on snow (and ice covered slopes); and have been covered by ice ever since. Had they not been – had they been exposed on ice free slopes for any significant interval they would have rotted away and not been their to be discovered. As such they are clear evidence that these sites (variously in the Rockies and Alps) are now warmer than they have ever been for the last 4 to 5 thousand years. a CO2-effect which is only 1/10 of obove statement -> close to 0.3K per doubling. Regarding the level of communication, and whether people can understand it: Realclimate was never the place to go for simple explanations. Maybe that’s unfortunate, but the “debate” is quickly driven to that level. It’s important that highly competent people can go in-depth somewhere, for the especially interested. I recommend John Cook’s Skeptical Science site (it’s in the blogroll here) for the basic explanations. Recently he and his many contributors have started a project to write basic, intermediate and advanced replies to all the common anti-climate science talking points. They are really good, IMO. Yes, Tamino has remarked on this somewhere on his “Open Mind” blog, to the effect that he doesn’t trust the Discover data for the last year or so. And Spencer apparently doesn’t see to Discover personally, so he actually doesn’t know, either–there was a discussion on this on his website somewhere–sorry I don’t have the link to either discussion. #14: Should be UAH channel 5. Check CP and Blackboard for details. good science is not always good enough for most people. To persuade people and change their beliefs, you need emotion rich communication. Actually, one might be able to come up with all sorts of unlikely, mysterious scenarios that account for the current level of warming (including a heat gun weilded by invisible Martians, CIA/UN/Mossad experiments…) if the temperature were the only data set that had to be explained. Throw in the distribution of the warming, stratospheric cooling…, and I think you might have a wee problem. 1) Soil moisture trends in a given region. If surface temperatures spike, and the ground is wet, evaporation rates increase, reducing the temperature by latent heat transfer. If dry, the temperature change is much greater. This can be considered a background climate condition that could very well contribute to the intensity of a heat wave, and is linked to precipitation, snowpack, etc. A Google Scholar search for “soil moisture” and “heat wave/s” (since 2000) turns up some 1,920 references. Include a specific region – such as Mediterranean – brings the number down to 600 or so. Generally, the conclusion is that if soils are unusually dry in southern Europe in late spring/early summer, the chances of intense heat waves in northern Europe are increased. Note also that wildfires and soil moisture are closely associated, and the global warming effect is clearly seen with intensified wildfire occurrence in many regions. 2) Researchers studying European heat waves point to additional influences, particularly that of sea surface temperature – which also influences continental precipitation, and hence soil moisture. Apparently, warm SST anomalies help reinforce the atmospheric conditions that lead to persistent heat waves (in the Mediterranean). Note also that under hot conditions a stream of water vapor may not form clouds, but will instead act as an infrared blanket that amplifies the heat wave (this kind of heat wave is seen in California, fed by marine moisture from Baja). 3) Larger-scale effects can play roles too. Here we are talking about modification of atmospheric circulation – poleward expansion of the dry, descending portion of the Hadley Cell circulation by a few degrees, associated shifts in the jet stream. Oceanic circulation also plays a role – not that the Gulf Stream would ever shut down, but the warm core rings shed into the North Atlantic could become bigger and warmer, affecting regional SSTs, and hence precipitation and soil moisture. So, if the data trend up to now and the models agree, then the projections – region by region – should be fairly robust, at least over the next century. If you want a similar answer for your own personal region, you have to do the same regional analysis – but hopefully, some state university has already done some of this work. Essentially for lay persons and those who doubt some of the climate science attribution: this RC entry basically shows increasing amounts of evidence and more compelling evidence to support that the recent heat waves may have some real involvement from AGW. It also clearly states more research and analysis is needed over time and that the claim is not being made with certainty. However, the heat wave and other findings are in line with projections and some predictions and the GCM’s model these phenomena pretty well. The IPCC report discusses this stuff quite extensively as well in terms of projections and liklihoods/probabilities. And of course Ray’s comment in post # 23 on stratospheric cooling. Tom Curtis @17 — Quite so, except for the being dropped on ice or snow bit. The requirement is simply a significant snow coverage soon after the material has stationary in those locations. @stephane #22… you’re correct, but here is the conundrum. Good scientists try to remove themselves from their work, and especially, their writing. The writing required by most peer-reviewed journals disallows even using the word “I” or “we” or “our group” when writing about the findings of their research (which can really make the process difficult, I’m learning). This becomes habit. It’s also often the case that when someone becomes very impassioned about a subject, they can either increase the chances of being biased, or at least can be perceived as doing so. This is why there really need to be intermediaries to the public, especially ones who aren’t political lightning rods, like Al Gore. We need some Carl Sagans. Since the recent heat wave and peat bog fires in Russia this summer have been used as evidence of an extreme weather event in response to global climate change, I thought a llterary reference to such events occurring periodically at least to the 12 th Century would be informative. The literature is in Russian although there is a translation of part of the list. For those interested in outcomes, the rain in mid-August quenched the fires, cleared the air within 24 hours, washed the landscape, buildings & roads. Tourists with allergies and asthma who came to Moscow the day after the first rain, developed no symptoms from the previous week’s air pollution. I’m a bit confused by your conclusion on this article. Keep in mind that temperature is not the only variable to consider. MapleLeaf @13 – For ERA40 2m-Temp is assimilated in a post-process method. During the atmosphere-land model run the SYNOP observations are NOT used. However, to make their 2m-Temp product ground based observations are later combined with the model estimate of 2m-Temp using an optimal interpolation scheme (you can find details in the ECMWF pages). Does that make sense? ECMWF is the only reanalysis to use the observed 2m-Temps in this way. All other RA’s (as far as I am aware) do not use these observations in their output data. Thanks Bystander @27! I think I understand now. I would not be surprised that ECMWF may be the only group who are using the 2m -Temps in their reanalysis, they really are at the forefront. Thanks. Not wanting to harp on, but the Climate Progress piece clarifies little. The UAH data link there is the same one I quoted and plotted at #14. It has UAH LT global at +0.77°C in April 1998, and +0.51°C in August 2010 – i.e. not even close to a record. Incidentally, RSS concurs (+0.86 and +0.58). Month to month comparison like this are pretty dopey I know, but hey, you started it (☺). …I no longer think that the UAH satellite dataset (Spencer’s daily plot?) should be relied on for monthly comparisons. Roy Spencer et al. are simply rejiggering and adjusting the data too much. This might all be legit, but if NASA or NOAA tried something like this, Watts and McIntyre and Spencer would be trashing them daily. And Spencer and Christy simply have not earned anybody’s trust about this sort of thing. It’s rubbish, whether you look at Ch4 or Ch5. Are we still looking at a 3-deg rise by the end of the century, in the light of the warmer and warmer findings, or are climate scientists now revising their predictions upwardly? PS I’m not a denier, but I did find the Russian literature egs interesting. Were they just randomly hot summers? Cheers. Admitedly, you do have anecdotal evidence of a longer drought than the current one (which is only the worst drought in 50 years, though the worst heatwave known in Russia); but that is equivocal evidence at best. The longer the drought, the lower the temperature needed to dessicate the peat bogs and allow fires to start. Sounds like the “20th century cannot be explained by the solar and volcanic activity alone, so it must be anthropogenic” fallacy. David Benson @26 – While conceding your point as technically correct, the actual examples of artifacts being uncovered by recent snow melts are almost all examples of artifacts originally dropped on snow or ice cover. Let’s consider the examples from your links in order. First we have an example of caribou dung preserved between ice layers, and hence necessarily deposited on ice. The caribou dung included one 4,300 year example exposed by melting, which given known caribou habits may also have been deposited on ice. In any event, at this site, the persistant summer temperature is now warmer than it has been at any time in the last 4,300 years. Second, we have the famous Schnidejoch glacier, whose oldest artifacts are 6,500 years old. Necessarilly, the many more recent artifacts were dropped on ice (or else the oldest artifacts would have rotted away), so this shows the southern Alps are now experiencing the warmest persistent summer temperatures in at least 6,500 years. It is of course, possible, that even the oldest artifacts were also dropped on ice, and were certainly covered with ice very shortly after being dropped. Fourth, we have Otzi who is known to have either died on ice, or been buried by it within hours of his death, due to the excellent preservation of his stomach contents. He shows temperatures in the southern alps have not persistently exceded modern values for 5,300 years. These finds consistently contradict claims of a MWP hotter than current temperatures; and are consistent with and 20th century temperatures on a par with those of the Holocene Climactic Optimum. And as Vendicar points out (15), we are nowhere near the peak of the modern, anthropogenic warming. I remember that. Everyone was elated about how much they could learn about people’s way of life back then, and I was thinking, “OMG, AGW is really happening” — Despite the fact that as an anthropologist, I should have been excited about the find itself. The fact that they found (if I remember) a similar “ice woman” in the Andes some years later, was just more proof of AGW for me…. Jim, I don’t agree that the argument is completely rubish. Anecdotal evidence is still evidence of climate variation, although evidence (I would agree) that should be treated with the greatest caution. Of course, RiHo08 didn’t use any caution in his treatment, and had he done so he would have seen the evidence does not support his point. Further, I take RiHo08’s point to have been that the evidence showed the 2010 Russion heatwave was not atypical, and that therefore the heatwave was not, by itself, evidence of Global Warming. Had his evidence supported the first point, it would have established the second. It is a “rubish argument” to argue that because there were warmings in the past, the current warming is not primarilly due to increased greenhouse gas concentrations, but that is a different argument from that which RiHo08 implied. And for the record, the 2003 discovery was a variety of artifacts from several eras at the Schnidejoch glacier. Of course (as I’ve learned here over the years), one record-breaking weather event, perhaps even a string of them, does not climate change make. It is the total stats — climate, not weather, that tells the story. This is how I understand it (correct me if I am wrong): It’s like with increasing GHGs in the atmosphere the dice are increasing loaded for such record-breaking events, but under the null hypothesis (that increasing GHGs have no effect) there is this very long long tail of possibility. So even if there is only a .00001 prob that such events could happen without increasing GHGs having a warming effect (and no other warming forcing), there is still that remote possibility of such an event happening under a no warming scenario. I don’t think now or in the next few decades or perhaps longer (under worst case scenarios) we would reach a point where a single very extreme weather event is a total impossibility under the null (no warming forcings). But the increasing amount of record-breaking events (as an aggregate) would be another indication of the warming trend (just as the increasing average world temps are). That’s more at the climate, statistical/aggregate level, beyond single weather events. 22 stephane: So we have to make science a central cultural value for everybody. Would making all high school students take 4 years of physics, 4 years of chemistry and 4 years of biology do it? Or is there something deeper, like the authoritarian personality thing? The article seems to say so. An article or book on this subject [ making science a central cultural value] would be most welcome. See my plot and query at #14. The Ch4 trace based on the Discover daily data has been tracking way high for all this year. Unclear why. Updated with Ch5, the plot looks like <a Href="http://members.optusnet.com.au/anon10/Global_monthly_temps_closeup_rev2.png"this. Ch5 seems to bare little relationship to the other data. It measures more mid-troposphere temps, so maybe there’s a good physical reason. For unusual sun and Atlantic activity in the last century start looking at wiki under sunspots (the 400 year history) and AMO for the peak in 1940 and after 2000. About the stratospheric cooling (Re #23), well you must be aware that any warming of the ground would have that signature in the stratospere, almost regardless of the reason. So, well, thank you for your try to answer, but I don’t think #18 is completly answered yet, sorry.. Regarding the use of 2m temperature observations in ERA-40 and ERA-Interim reanalyses: Response #30 is close to correct. A clear and more detailed explanation can be found in Section 2.1 of the Simmons et al 2010 JGR article “Low-frequency variations in surface atmospheric humidity, temperature, and precipitation: Inferences from reanalyses and monthly gridded observational data sets” (doi:10.1029/2009JD012442). yes we need figureheads able to bridge the huge gap (and widening I think) between the usual world and style of the scientists and the others (even politicians). And I do feel people must have more scientific education than now (at least in france) and a more rationnal approach. without this, most discussions grow sterile quickly because belief is stronger than knowledge due to the natural approach use by our mind : it’s emotions who stress what is important and when absent, it means that’s what we are considering is not important…. there is profound repercussions to school and teachings which are mostly ignored. I must thank laws of nature for his suggestions (#45). Having looked at the relevant charts and can see clearly how the AMO and sunspot activity between them explain why Global temperatures in the 1880’s were so high, why the peak global temperature in the 20th century was in the 1960, and why global temperatures fell so precipitously for the two decades following 1970. Of course, in the real world, the 1880’s where exceptionaly cold, peak 20th century warmth was in the 1990’s (which in turn were cooler than the first decade of the 21st century), and the 1970’s and following decades were characterised by an ongoing rise in temperatures. Why is it that denialists insist that the imperfect correlation of CO2 concentrations and global temperatures is a clear disproof of any causal connection between the two; while insisting that even worse correlations between solar activity (and various oceanic oscillations) are proof that they are the drivers of global temperature? And Laws of Nature, for the record, and increase of solar activity will warm the stratosphere proportionally more than it warms the surface and troposphere. In fact, only warming by an enhanced greenhouse effect will warm nights more than day, polar regions (and especially the arctic*) more than tropical regions, and cool the stratosphere while warming the troposphere – all of which are features of the current warming. *this is not special pleading, the anctarctic will not warm as fast as the arctic because there is a negative lapse rate (the temperature gets warmer as you get higher) over the antarctic. Methinks maybe you haven’t thought through the issue of stratospheric cooling very much. Prove me wrong: Propose a warming mechansim other than greenhouse gasses that would cool the stratosphere. 1)solar irradiance has been pretty flat for 50 years. 2)AMO is an oscillation–care to suggest how that produces steady warming? So far, I’m not to impressed with your reasoning.